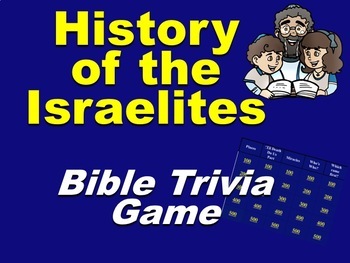 This fun Bible trivia game is a great way to review some of the highlights from the Old Testament including the history of God's chosen people, the Israelites. Questions range from the promises of Abraham to the conquest of Jerusalem by Babylon. The questions are designed for elementary school aged kids, however, and should not be too difficult. 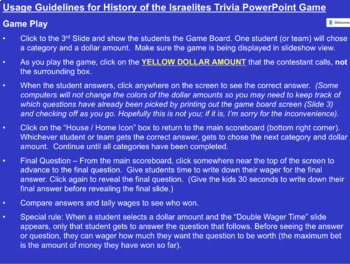 I originally created this trivia game to use as a review of the Israelite's history after we finished a multi-week unit about the Hebrew people from the Old Testament in the Bible. 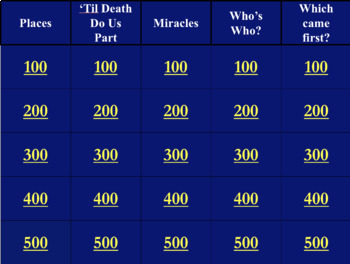 The kids love the fun format, which is similar to other popular trivia games on TV. Students select the category and dollar amount. Kids then have to choose the correct question to the answer they see. Question: What is his hair? Question: What is the ten plagues struck Egypt? Also included is a Final Question. Final Question: What are prophets? 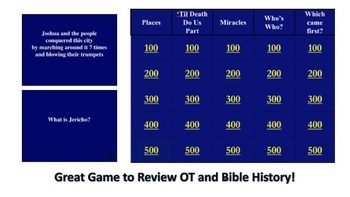 This PowerPoint game can be used time and time again Christian schools and Sunday school classes. It's great for Sunday school lessons about the Israelites and the Old Testament, for game days, or for parties. Instructions to play the game are included. This game is designed to be used with PowerPoint. Thank you for visiting my store! Please follow me by clicking the green star on my store's homepage for freebies and updates. And don't forget to earn TpT credit by rating this purchase. Old Testament Character Review Game | Who Am I?